I will walk you through this exercise and when you have read it all, go ahead and close your eyes and walk yourself through it. You don't need to actually see anything to do the exercise. You can just pretend. Subtle energy is effected by your intent. BUT YOU CAN GET THE AUDIO FILE EMAILED TO YOU FREE RIGHT NOW, WITH NO STRINGS ATTACHED! JUST BY ASKING FOR IT! There is an energy field around each of us. It is shaped somewhat like an eggshell. There are many different colors - and perhaps some clouds in it. The "eggshell" expands or contracts, depending on what you are doing. When you relax, it expands. When you are uncomfortable, it pulls in, towards you. Many people have so many grey clouds in their "eggshell" that you can't see their colors. Many have "holes," "tears" or "rips" in the outer layers of energy. It's also common for there to be little "entities" stuck on the energy field, sucking on people or for there to be implants in the field, blocking the energy from flowing easily. Those entities and/or energy blocks can actually cause physical illnesses that that have been hard to a Dr. to diagnose or treat - like Chronic Fatigue, recurrent headaches, strange aches and pains... and other things. First, let's start your Clearing by cleaning up your energy and strengthening your psychic protection. Pretend that you have an eggshell surrounding you. Put your attention on the shell part of the egg. Pay close attention to this part. Pretend that you can make the shell get thicker and thicker, until it is about ½" to 2" thick, or so. It's a nice, tough eggshell that allows only the highest vibrations through. All other vibrations just bounce off and away from you. Allow the shell to thicken for a few moments. Then, check the outside of the shell for any rips or tears in the Eggshell. Many people have them, so if you do find one, just close it up. You can do this by pretending that you have a needle and thread, or perhaps superglue and a patch... or whatever you would like to use to close the hole up and keep the eggshell strong. When the Eggshell is nice and solid, take out a spray can with a big nozzle and spray a thick Teflon coating on the outside of the shell. This will allow anything that is thrown at you (by anyone or anything) to slide right off of your outer protective Eggshell. It will just fall away harmlessly and dissolve into neutrality. **In an extreme case of Psychic Attack, you can use a mirror on the outside of the Eggshell, for a short while. This will send whatever is thrown at you back to the person. But keep in mind that this will continue the Karmic game between the two of you, and I don't recommend it as something to do under normal circumstances. Try the "teflon coating" first. Remember, a mirror coating will return to sender, whatever that person has sent to you - and that return has a tendency to keep the energies between you going on and on. If you feel you've done the best you can and the other person just won't let up on you... if they don't get the message any other way, deflect it back to them so that they get a taste of their own medicine. Just keep in mind that no matter how much it feels like you are the victim when you have someone attacking you, you still bear some responsibility for the situation. You opened yourself up to having energy thrown at you, by throwing it at someone else first. Maybe not that person, but someone else along the way. That's how these things work. Even if you didn't start the problem in this life, IF you believe that we have lived before and will live again, then things start to get more complicated. How can you answer that? Maybe this time the other person did it first... but maybe in the last life, you did. Take a deep breath and detach from the situation a bit - and let it all come to a stop. When you have your eggshell solid - the best you can get it - you need to Ground yourself. Pretend or imagine a cord or perhaps tree roots coming out of the base of your spine and going down through the shell, deep down into the ground. This cord (or roots) will not interfere with the strength of the Eggshell or allow anything back into it. When you are Grounded, you can easily draw strength and energy from the earth, if you wish. IT helps your own energy to flow more naturally, through the top of your head and down the spine, and then out the Grounding cord or roots. The energy flows out, and you can also draw energy in through it, but nothing else can come back into your energy field in that way. At the bottom of the eggshell there is a drain. It is a one way drain or valve. Stuff goes out, but it cannot get back in. Remember to put the drain in, so nothing backs up! Next, pretend or imagine a beautiful white light coming in through the top of the eggshell and cleaning out the inside. I pretend that I have a shower head at the top of the shell, inside, with a hand held sprayer, squirting out white light that I can spray around at different areas. Some places in your energy may have clouds or haze. This white light will clear it out. Continue to spray out the inside; clean the inside, the energy in the shell and also spray your physical body with the white light. Let the spray clean out any dirty or grey places and then let the dirty stuff go out of the eggshell, through the drain. The drain will not interfere with the Grounding cord or roots, coming out of the base of your spine. When you are finished spraying it out, check the outside of your Eggshell again. This time notice whether or not there are any objects or entities stuck onto the outside of it. Check very carefully. Then check the inside and then closer to your body. Look for the tick like things, and if you find them, just pull them off and drop them through the drain, or hand them to your Guardian Angel and ask him or her to help you dispose of them properly. They can easily reach right through into your energy to help you, IF you ask them to, as they are of the Highest Energies. There is no need to fear these entities. They are rather like fleas or ticks - unpleasant, but not usually lethal. Treating them with anger or fear will simply continue the cycle. These exercises are all about detachment, not about getting even more involved with the emotions that a Psychic Attack can set off. After you get the entities off, go back and spray the shell out again. Then look again. This time look for anything that seems out of place. These are implants. They can look like a screw, a bolt, a splinter... anything that looks like it doesn't belong there. Remember to look at the back of the neck, under the arms, behind the knees, and between the toes. It's common to find them in these areas. If you find anything, remove it/them. You might flush them down your drain and into "neutrality" or hand them to your Guardian Angel to dispose of properly. Then look again at the inside of your energy field. Spray it out again. 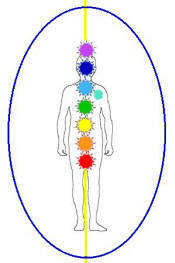 Now place your attention on the base Chakra (Click here for a page on Chakras) and notice if you feel any cords or strings coming out of it. Check the back and the front. These Karmic ties or 'strings' might feel like cobwebs, or like big ropes. So just pretend the strings or ties are there. Now you might want to take a moment and ask yourself "who do these strings go to?" See if an answer pops into your head. It could be interesting. In any case, now pretend that you have a large pair or scissors or maybe a sharp knife. (I use a sword sometimes or even pull them out!) You cut only what is appropriate and natural and correct for you, at this time, leaving only the ties of the Highest love in place. That is your intent, and so it shall be. "I now cut these Karmic ties, granting the person, place or thing their freedom, thereby granting myself freedom." When you are done, check your Grounding again and strengthen your Eggshell one more time. Then slowly open your eyes. You are clear! These techniques will keep you in a bubble of clear space, if you continue to do the various steps. At first you will need to clean it out often. As time goes on, you will develop a feel for what your routine maintenance schedule should be. A hint: You will need to cut ties more than once. Once in awhile you will find a tie that comes back almost at once. Just be patient and keep cutting it or even pulling it out. Eventually, it will stop coming back. NOTE: If you have tried the protection exercise, and it's not working for you as you'd hoped, then there is a big chance that you have not paid attention to cutting the cords that are going to each of your chakras. Go back and do it again, this time cutting the cords. You have to do it in the order that I have laid out or it won't work right. It's like washing off layers of grime so that you can see what is under each layer in order to clean that one. Nothing else will do any good if you forget to cut the cords. You may have to cut those cords again and again, hundreds of times. Chances are you've had them for a long, long time, it will take some time to get rid of them. Be patient. People always ask me this question: How often do YOU do this exercise? I do it everyday. Sometimes more than once a day, if I am under stress. I am pretty fast at doing it after many years of practice, but even now, there are some times when I must take my time and be certain that I get everything right. Remember, NEVER throw energy at anyone. That is a Psychic Attack and has serious side effects for the person who does it. The point is to protect yourself, not to violate anyone else. Any time you use this energy for your own selfish purposes, it is wrong and there will be consequences. Although spiritual experiences are extremely subjective in nature, the experiences people have are surprisingly consistent. There is a thread of continuity that runs through the experiences that cannot be ignored. People report visiting the same "places" on the "Other Side" and even meeting the same personalities. There are people who do not believe, people who do believe, and then there are people who KNOW. The point of this work is to have that knowledge for yourself - NOT just a belief. Empower yourself with the sure knowledge that you will be assisted in your journey through this life, by Masters and Angels and other Higher Beings - if you are willing. Make it easier on yourself and on them - practice a bit of self discipline! Please remember, I do not do private readings anymore - so PLEASE do not email me and ask questions that are really asking for a reading without actually asking for one. I have had over 3300 emails since January 1, 2012 asking me that sort of thing. If you start an email with... "I know you don't do readings, but..." that's basically the same as asking for a reading! Please respect that I do not do readings!